(LOS ANGELES) It takes more than bell bottoms to nab an Academy Award nom! 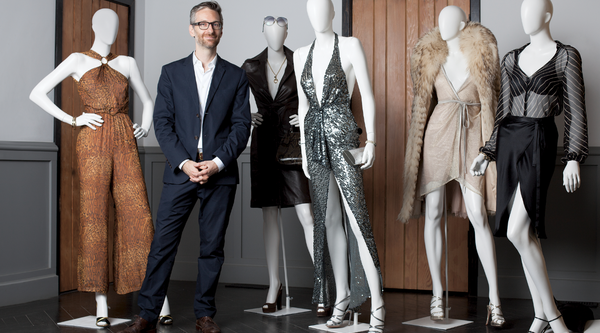 How did American Hustle costume designer Michael Wilkinson end up in the running? It’s a precise equation, that included director David O. Russell, an all-star cast, innumerable trips to the vintage vault, and a whole lot of stretchy fabric. What was your reaction when you first read the American Hustle script? I was so thrilled to find that the characters have such a fascinating relationship with their clothes. They use clothes as part of their hustle and as a way of reinventing themselves in their fight to survive. I had just finished Man of Steel, and one of the producers on that project was also producing this project with David O. Russell. He suggested me for the job. I had also worked with the production designer a while ago, so all the stars sort of aligned to make it happen. After you signed on, what inspired you? We looked at films and poured over photos of people from the period. We sought out high-brow references from magazines, and photographers like Richard Avedon and Helmut Newton. We also looked at the other end of the spectrum, like mail-order catalogues, to make sure we were breathing as much authenticity into our characters as possible. Any particular people from the ’70s? For Amy Adams’s character, we talked about people like Bianca Jagger, Jerry Hall, Faye Dunaway, and Lauren Hutton. For Bradley Cooper, we talked about John Travolta and Robert Redford. For Christian Bale’s character, it was Serge Gainsbourg and Hugh Hefner. We had two months to get it all together. You pulled from Halston’s archive for the film, right? We did. We were led down into the bowels of their building and the doors opened to racks of clothes from the beginning of Halston’s career. We were able to go through it piece by piece. We ended up using four or five key pieces for Amy. Gucci also sent us some accessories and jewelry. Apart from that, we used designer pieces that we found in vintage boutiques or borrowed from collectors around the country. We had some Diane von Furstenberg, Christian Dior, Valentino, and some vintage Bob Mackie. How many pieces in the film were custom made? We made about 40 to 50 percent of the clothes so I could ensure that they had the very specific quality and fit for a particular scene. I usually just do a basic line drawing to explain how the clothes will articulate, then we select the fabrics and take the drawing to the seamstress, who makes a sample with test fabric. After I approve that, we create it out of the final fabric, have a fitting, make the alterations, do camera tests, and it’s ready to go. The casino scene was the climax of the film. Was it also the climax for the costumes? It was a moment where you have lots of forces colliding. The background scene has a lot of New Jersey flavor and the clothes are maybe more representative of the early ’70s, with simpler lines, exaggerated collars, and high platform boots. Amy’s character had to walk in and feel like it was 1978, so I designed something from scratch. It had very strong lines with an extremely low plunging halter, and an almost sheer gun-metal fabric that hugged her body in a very provocative way. Her character was coming from Long Island, and I liked the idea that her character didn’t always get things right with her clothes. I designed a dress in a metallic stretch jersey that was very low plummeting. When she squeezes into the dress, it has this dangerous, can’t-take-your-eyes-off-her look to it. Did the girls get to keep anything? There was a pair of amazing purple satin pants that Amy wore for a disco scene that didn’t make it into the film. She called them her ‘Happy Pants’ because they were so tight and she was excited whenever she saw them. We gifted those to her. How did you approach dressing the guys? It was really important for us to not be cliché or make any obviously cheesy choices. We wanted to seek out very colorful, unusual pieces to suit how idiosyncratic the characters are. Which male character was the most outlandish dresser? Jeremy Renner’s character sees himself as this sort of shining hope of New Jersey. He dresses in a very aspirational way, in what David called “ice cream suits.” It’s the style of dressing that sort of typifies Italians living in New Jersey back then. How many costumes did the main stars require? Amy and Christian had about 40 or 50 changes in the film. Jeremy, Bradley, and Jennifer had a few less than that. That seems like a lot of clothes for Amy! The film takes place over many years. When she arrives, her clothes are somewhat naïve and simple. As she falls in love and gets the resources and confidence to dress herself as the woman she wants to be, we see a real transformation in her clothes. Over the course of 40 costume changes, you see her slow progression into one of the most sophisticated dressers in New York City. Do you like designing transformations? Transformations are what I live for! Bradley Cooper starts off as a guy from The Bronx—he’s an FBI agent who wears ill-fitting polyester suits and garish ties. When he meets Amy and Christian’s characters, a whole world opens up to him. He goes from all polyester to silk shirts and wool three-piece suits. He’s playing with how clothes can make you feel, and how they change the way the world looks at you. Did you have a say in Jennifer’s brilliant red nails? After I helped her get dressed, I’d go to the makeup trailer with her and make sure everyone was on the same page with up-dos, down-dos, and all that business. We worked very closely with the hair and makeup team, since the hustle we were trying to convey was head-to-toe. Who was the most fun in fittings? I had a lot of fun with the English accent from Amy, and Christian would change the way he walked or stood as soon as he put on the clothes. What will you be wearing on the Oscars red carpet? Gucci has offered to make a tuxedo for me and they’re allowing me to be involved with the design, fabric choices, and details. Who knows? It may even have a little bit of American Hustle flair! You’ve worked with Catherine Martin, who’s also nominated for The Great Gatsby. Any competition there? Not at all! We go back a long way and it will be fun to share the evening with her. Where were you when you found out you were nominated for an Oscar? In bed. My agent called at 5:30 in the morning! Who did you call after you found out? My parents in Australia. For the first time ever, I didn’t even check the time difference. If you win, where will you keep your Oscar? I’m sure that I’ll find a place, but even talking about the statuette freaks me out!